Adventurers embarking on a small ship adventure cruise in Alaska or a river cruise on the Columbia & Snake Rivers may now extend their Un-Cruise experience on shore with two new land tours. Beginning in 2016, Un-Cruise Adventures offers a Denali Park & Knik River Adventure tour and a train journey through Canada and the Pacific Northwest aboard the Rocky Mountaineer. "Our guests say they're interested in extending their trips with us, so we're developing land tours to connect with our cruises," said Captain Dan Blanchard, CEO. "We are offering land tours that match our unrushed, uncrowded, unbelievable concept delivered by our ships to ensure our spirit of adventure extends through all we do." A scenic train journey explores the Sea to Sky corridor and the Canadian Rockies. The Rocky Mountaineer extension has two itineraries combinable with either Alaska or Columbia & Snake River cruises. An 8-night pre- or post-cruise Rocky Mountaineer tour between Seattle and Vancouver, BC (or reverse) can be added to the Columbia & Snake River cruise. Traveling via first-class GoldLeaf rail service, guests view scenic Howe sound, the lush farmland of the Pemberton Valley and the dramatic scenery of the Canadian Rockies with overnight stays in Seattle, Whistler, Quesnel, Kamloops and Vancouver. Two nights are spent in the alpine town of Jasper with a half-day guided tour of Jasper National Park, a UNESCO World Heritage Site. Rail service, hotel accommodations, excursions/tours, park passes and select meals are included with rates starting at $7,895 per person, based on double occupancy. In Alaska, the Exploring Muir's Wilderness cruise connects with a pre-cruise 7-night Rocky Mountaineer train journey between Calgary, Alberta and Seattle, Washington. 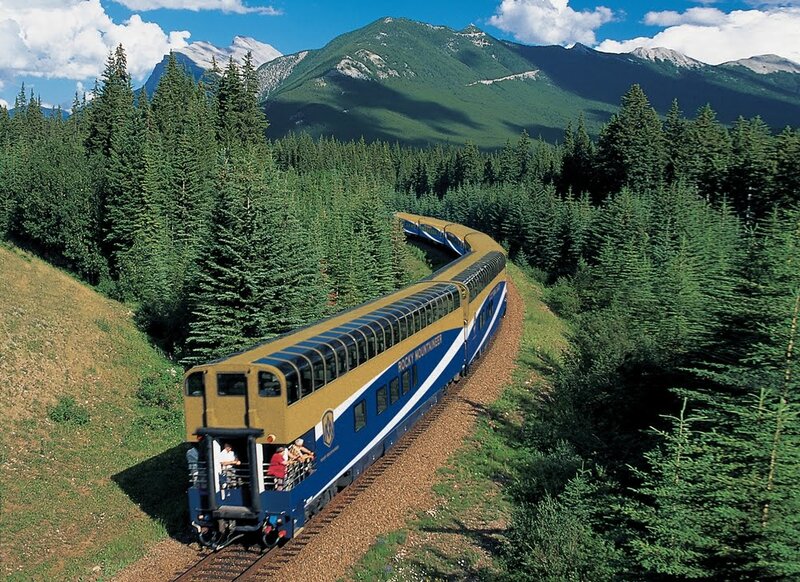 First-class rail service travels through glacier and snow-capped peaks of the Canadian Rockies, the desert-like interior, to the lush forests along the coast. Overnights are spent in hotels in Calgary, Lake Louise, Banff, Kamloops, Vancouver and Seattle. Highlights include a helicopter tour over the Rockies, the Banff gondola, Yoho National Park, a guided tour of Vancouver's North Shore and a gondola ride to Grouse Mountain. Rail service, hotel accommodations, excursions/tours, park passes and select meals are included with rates starting at $5,395 per person, based on double occupancy. Also beginning in April 2016, an escorted Denali National Park & Knik River Adventure package travels from Fairbanks, Alaska via an exclusive rail car accessed through a private entrance at the Fairbanks train station. A Un-Cruise Adventures' guide travels with guests for the duration of the tour for seamless logistics and an extension of the line's service from sea to land. Two nights are spent at a backcountry lodge inside Denali National Park with ample time for hiking, fly fishing, mountain biking and guided touring. From the Denali rail depot, continue in a first-class deluxe dome rail car to Talkeetna, a historic gold mining town. Explore the area and enjoy a group dinner before a private transfer to Knik River Lodge. Two days at Knik River Lodge are spent in comfortable riverside cabins with decks for viewing wildlife, mountains and possibly the Northern Lights. At Knik, guests may hike the Chugach Mountain trail and explore the historic Independence Mine near the Knik River. Departing Knik, a short morning ride to Anchorage brings guests to the Alaska Native Heritage Center with presentations of dance, elder talk and Native Olympics, time to explore the city and an overnight stay. Airport transfers, hotel accommodations, rail transportation and select meals are included. Guests choose a six-, seven- or eight-night package to connect with the line's Alaska adventure cruise. Additional land package tours are also available including the Alaska Railroad & Denali National Park Adventure and Winterlake Lodge. Celebrating 20 years in 2016, Un-Cruise Adventures operates a fleet of eight small ships carrying 22-88 guests. Boutique yachts, expedition vessels and small ships sail adventure and river cruises in Alaska, Hawaiian Islands, Mexico's Sea of Cortés and the Pacific Northwest. In 2016, eight departures will be offered in the Galápagos Islands and adventure cruising begins in Costa Rica/Panamá. An all Panamá adventure cruise begins in 2017.